F R I E N D S. No, I’m not referring to the now-defunct well-loved American sitcom, but my own childhood friends and the new friends I continue to gain, as well as the blessing friendships have given to me. As you may already know, the age gap between my siblings and me is so wide, i.e., 9–12 years. Hence, friends to me were really like the siblings (close to my age) that God never gave me. 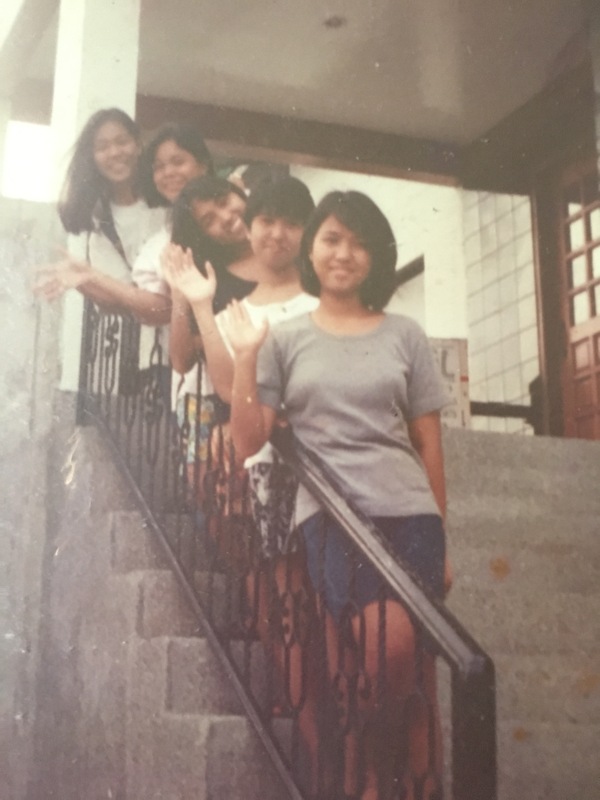 When we were still living in Manila, I didn’t really have a lot of friends or playmates. In fact, I only had one and I have no idea where she is now. Before I started schooling, my parents had a house built at a small quiet subdivision in Las Pinas, which was still being developed then. Although the place was part of Metro Manila, it felt more like we were in a province. Roads were unpaved, except for the highway, and you would see the sea, salt beds, and rice fields, going to our new home as you travel for 2–3 hours. There was not a single mall too, and this was back in the early 80’s. Despite the lack of entertainment or pasyalan like huge department stores or malls, fast food restaurants, and parks in Las Piñas, the place grew on me and I couldn’t complain except for the eerie silence at night, especially when we were still new to the neighborhood, and the salty drinking water that I always had to force down my throat. Unlike the quaint Spanish style house we had in Manila, with wooden floors and capiz windows, our house in Las Piñas was built with concrete walls, tiled flooring, glass windows, and has a mini garden and a garage. It was very homey, airy, and comfortable. 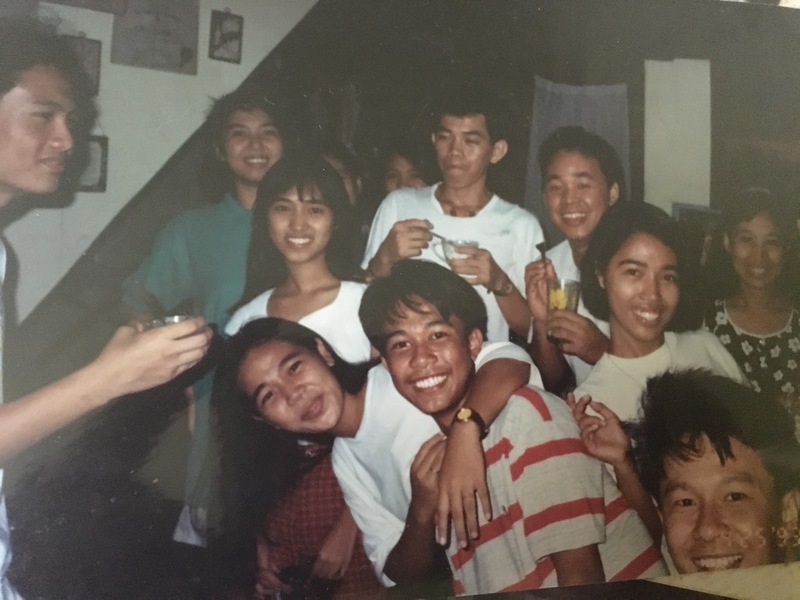 Not that I am complaining about our previous home, which I also loved, but it was really a blessing for me that we moved to Las Piñas, for I probably would have grown up all alone and would never know what it’s really like to have a fun, safe, and colorful childhood if we had not moved. Moreover, I would’ve missed the chance of having good friends from childhood. My childhood years in Las Piñas were marked by having numerous friends or playmates, adventures under the sun, weird hobbies, and games played outdoors until the moon and stars would appear in the sky. Of course, there were experiences that weren’t that good either, but they’re not enough to darken my childhood memories. For one, I would always be heartbroken whenever one of my close friends would move away, though that never stopped me from making new friends or being part of a new barkada. Growing up, I had different groups of friends, and this weekend I had the pleasure of getting together with one of them. We call ourselves the ANSWER. The group was originally formed by my older brother Manny and his friends during their college years. I suppose you can say that my friends and I were the second (and last) generation of ANSWER, and nearly each one of us was related to the original or older members of the group. ANSWER stands for Association of Neighbors Systematically Working for Effective Reforms, and my brother’s one of the brains behind it. They were the youth who set out to make a difference in our small community, organizing various projects that would make our tiny subdivision a model community, particularly in terms of safety, cleanliness, and unity among neighbors. 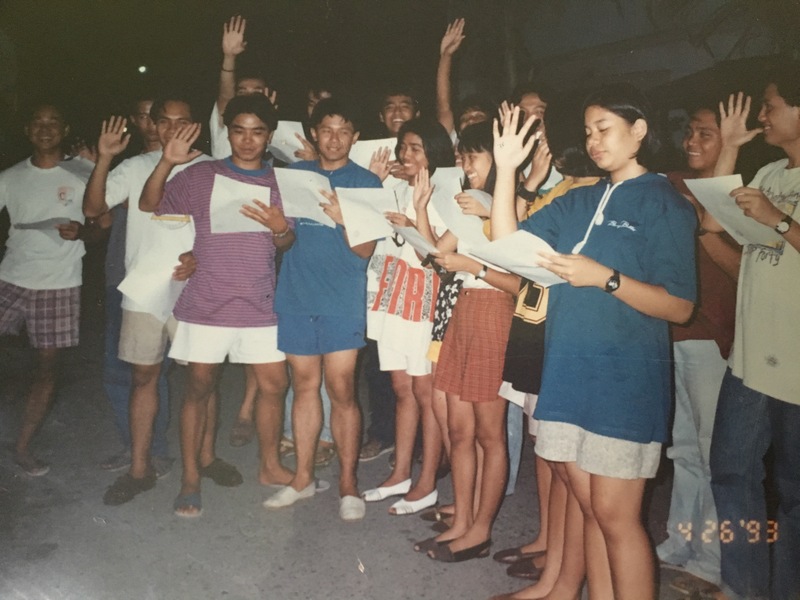 ANSWER oath-taking. It seemed I was the only one who took it seriously. 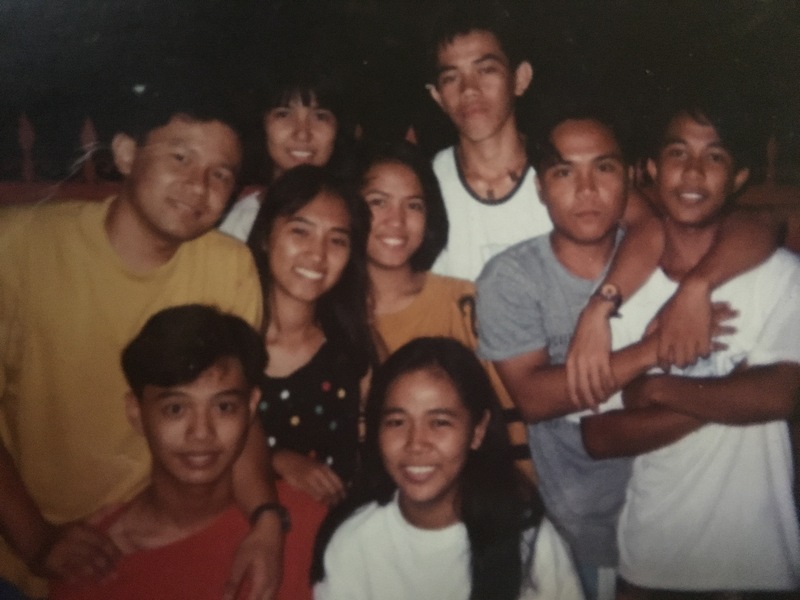 Although we, the younger generation, were not as vocal or assertive as my brother and his friends were, we were united and formed a rather unique friendship, which was strengthened by the innumerable brownout episodes one summer, when the late Cory Aquino was still the country’s president. Indeed, that must be the only time I was ever thankful for brownouts because those were the only instances my parents would allow me to meet with my friends after dinner. We would usually stay outside late into the night or until the electricity was back, especially that it’s too hot (and boring) to stay inside the house. Besides, I had my big brother and his friends look out for me and my friends, so my parents really had nothing to worry about. Brothers, sisters, cousins, friends, neighbors. The guy with a huge smile in the right-hand corner’s my brother, by the way. I’d say the friendship that was formed between us, save for the one I already had with the girls, was rather unlikely. Admit it: big brothers/big sisters don’t normally have their younger siblings or younger cousins as part of their peer groups, right? But that’s exactly the kind of group or barkada that we had inadvertently created. At first, it was always just me and my friend Baby, though two of her older sisters, Jiji and Jennie, would indulge us and play with us from time to time. Sometimes, our friend Ishi, who didn’t really grow up in the same neighborhood as we did, would join us too. Baby’s eldest sister and my older brother belonged to another universe with their own set of friends, until voila, theirs and ours collided and became one. The younger siblings and cousins of their friends–mostly males–went onboard too, and Baby and I just found ourselves being friends with those seemingly unfriendly boys in our tiny village, who we never imagined talking to, especially when we were much younger. Even when the brownouts had finally ceased, we continued to meet, especially during summer evenings and Friday nights. Except for the boys, our (group) meetings became less frequent over the years though, particularly when we reached our third year in college, and it became even more infrequent when we started working, to nada when we each began settling down. Nearly all of us have a family of his/her own now, with two members of our group marrying each other. Some have also lost a parent or two, like myself. Most of us have moved to another city and a few migrated to other countries. Thanks to Facebook, however, and Baby’s initiative, we started connecting again a few months ago. And, this weekend, I finally got to talk to my dear friends face-to-face once more, after a decade or so, especially that Baby and her sisters Ate Jiji and Ate Jennie, with their respective families, are vacationing from abroad. Though our group wasn’t complete and an hour of bonding with them was very short indeed, I would always treasure our brief togetherness nonetheless. It felt like we were never really apart from each other, even if we had not seen or talked to one other (in person) for years. I guess that’s the cool thing about having good friends – you just pick up where you left off as if it was just yesterday when you last saw each other.